Naples Fireplace mantel have a very Mediterranean/Florida feel to it. With the Palm Leaves in the mantel shelf projecting outward. The “S” scroll style at the bottom of the pearl corbel leg. Large multi step mantel shelf with leaves and lines in the design. Florida has a tropical Mediterranean feel and this design barrows from those styles. 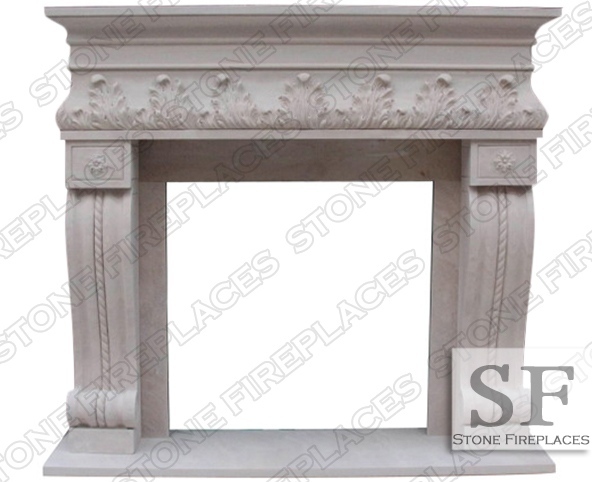 This large fireplace can be made from marble or limestone. Here the Naples Fl is carved from sandstone. This surround can be ordered custom made-to-order.